In the six seasons of The Avengers original run, the show had transformed itself from a police procedural to one of the most innovative shows around. Steed had been partnered with two impressive actresses, Honor Blackman, and Diana Rigg, both of whom left to star in different James Bond films. With the post of assistant vacant by season six, it was time to find a new actress and the show found Linda Thorson, playing Tara King. 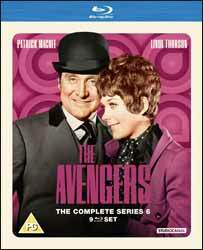 The Avengers: The Complete Series 6 (1968 - 69) saw the show go through a troubled start; Brian Clemens and Albert Fennell,who had headed up the show’s success, were replaced by John Bryce, who had previously worked on the show. With Bryce in command the show was to move to more realistic stories, dumping the humour and surrealism which had continued to grow through Rigg's tenure. Unfortunately for Bryce the studio did not agree and after the screening of the first three stories, he was fired and Clemens and Fennell returned to head another successful season. Some of the changes did stick. Tara was going to be something different, whereas Mrs Peel was Steed's partner, she was essentially an amateur. Tara would be an inexperienced agent in Steed's own organisation. This also had the further advantage of allowing the audience to see who Steed worked for and introduced another new character, in the form of Mother, Steed's boss, played by Patrick Newell. Season six barely missed a beat, producing some excellent stories and the show continued until its final cancellation. The show stopped not because of any loss of interest, nor the departure of Rigg, but the slow loss of audience in the States. The show was relatively expensive to make as it was recorded on film. A shame at the time, but it does mean that the versions on this nine disc Blu-ray set look like they could have been made yesterday. The set contains all of the episodes complete and uncut, but it is with the extras that the set really shines. There are full length commentaries for Split (Director Roy Ward Baker & Brian Clemens), Love All! (Writer Jeremy Burnham & guest star Veronica Strong), Killer (Jennifer Croxton), The Morning After (director John Hough), Game (Director Robert Fuest) and Noon Doomsday (Linda Thorson and her stunt double Cyd Child). Disc one also has the American End Credits for Invasion of the Earthmen (1 min, 07 sec), the Introducing Linda Thorson Promotional Trailer (2 min, 53 sec) with Patrick MacNee apparently trying to go for the record as to how many times you can say Linda Thorson in one single promo. More substantial are the Artistes Screen Tests, which include the tests for the girls who were up for the part, unfortunately this film was discovered without a sound track, but you get narration for the screen tests of Lyn Ashley (12 min, 10 sec), Diane Clare (8 min), Susan Engel (12 min, 27 sec) and Jane Murdock (12 min, 29 sec). Disc one also has a Varient End Titles (1 min, 07 sec) and Granada+points (1 min, 02 sec) for The Forget-Me-Knot, the double length first story which introduced Tara and gave Mrs Peel her last story. All of the discs have stills galleries included. Disc two has more Textless Closing Credits (1 min, 02 sec) not only is the sequences sans text the sound is also missing. There is the Girl About Town Promotional Trailer (8 min, 05 sec) which is a portrayal of the actress, with interviews with her. Like the show this appears to have been made on film so remains a pretty good quality print. Disc Three has the German Opening and Closing Titles (1 min, 28 sec) it’s the same titles, but with German text. There is a Filmed Episode Intro by Cyril Frankel to Whoever Shot Poor George Stroke XR40? (2 min, 52 sec) with the director of that particular story. It’s a nice little snippet. The disc also contains the Standard Bumper Slate (19 sec), the little bits which were used to frame the adverts. Disc Four kicks off proceedings with the two commentaries for Game and Noon Doomsday. Disc Five has the Tara King Special (18 min, 38 sec) which is a German documentary, with Oliver Kalkofe and a pretty good one it is. It is well informed about the productions history and has some insightful analysis for why the season didn’t work as well as the Diana Rigg seasons. In the Footsteps of Tara King – Oliver Kalkofe meets Linda Thorson (19 min 04 sec) and Oli is off to talk to the lady herself, it an honest interview and well worth watching. Wish you were Here – Location Featurette (14 min, 47 sec) takes you through the top ten filming locations, with a then and now comparison. Disc Six has Filmed Episode intro by Linda Thorson to The Interrogators (1 min, 07 sec) which looks to have been filmed in the seventies or eighties. Much of the first season of The Avengers was consigned to the great rubbish tip, which was the loss of a great deal of television. However, some fans took photo of the show, the only way to relive it in a time before VHS, let alone DVD. This has allowed episodes to be reconstructed and here we have reconstructions of The Springers (8 min, 12 sec) and The Yellow Needle (8 min, 58 sec). The combination of narration and stills at least gives you an impression of what the original show would have been like. Disc Seven has another two filmed intros by Linda Thorson, for Love All (1 min, 04 sec) and Take Me to your Leader (40 sec). Disc Eight has Linda’s filmed intros to Pandora (53 sec) and Thingumajig (40 sec). Disc Nine, and we finally have reached the end of the extensive extras with some more Artists Test Footage, this time for Toby Robins (9 min, 08 sec), Susan Travers (8 min, 34 sec), Wanda Vetham (7 min, 52 sec), Valerie Van Ost (8 min, 53 sec), James Maxwell and Moray Watson (5 min, 33 sec). Like the previous tests there is no audio track, but there is a narration which tells you about the actresses. There is the last intro by Linda, for Requiem (44 sec) and two more reconstructed episodes, The Far-Distant Dead (8 min 58 sec) and The Deadly Air (8 min 42 sec). So, there you have it, it’s quite a massive and well balanced set, with a surprising amount of extras for a show of this age. The print is pristine and although you only get a two channel audio track it is as clean as the picture. For a fan of The Avengers I’m not sure that you could have created a package which bettered this one.